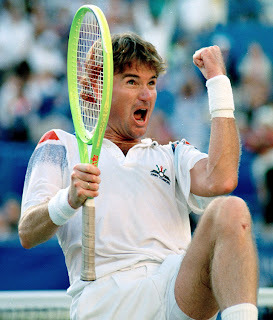 In 1991, a thirty-eight year old Jimmy Connors was widely considered to be finished. He has not even played in the previous year's U.S. Open due to knee surgery. But he then went on to "the best 11 days of my life" in Flushing Meadows that year and went on a spectacular run all the way to the semifinals, knocking off Patrick McEnroe, Michiel Shapers, Karel Novacek, Aaron Krickstein on his thirty-ninth birthday, and Paul Haarhuis. He did end up falling to Jim Courier in the semifinals on Super Saturday but that run that enchanted the packed Louis Armstrong Stadium every step of the way will stand as one of the most memorable moments in U.S. Open history. Earlier on CBS, they aired a feature in which Connors relived that run twenty years ago. Let's go to the videotape.